Storey Publishing, LLC, 9781612120249, 288pp. Vinton (Put ’em Up!) 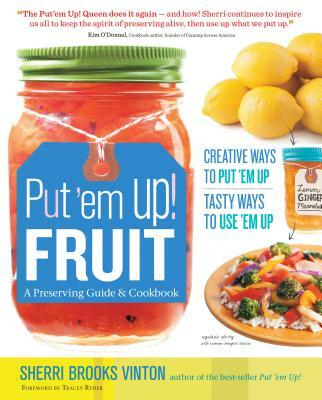 offers another collection of preserving recipes, this time focused on fruit. The author here reviews various types of preserves, water-bath canning, and troubleshooting techniques, providing clear and concise advice. Vinton expands beyond basic jellies and jams to include conserves, curds, gastriques, and more; each preserve recipe is accompanied by complementary recipes for meals, such as Sticky Chicken Legs (with Quick Apricot Jam), Duck Moo Shu (with Five-Spice Plum Sauce), and Momma’s Manhattan (with Maraschino Cherries). The author emphasizes that preserves can be interchanged in the recipes to give readers a wide breadth of choices and tastes. Verdict This bright collection of paired recipes will serve as a stepping-stone for those who are interested in learning to preserve but who want guidance for using what they make. A great companion to Vinton’s first cookbook.